This lovely salad has been brought to you by Market Street, and I am happy to give you my honest opinions about the entire delicious process. It's almost time for fresh cherries to be arriving in grocery stores. Cherries are good in so many dishes, but one of my favorite ways to enjoy them is in this fresh, crunchy salad. The sweet cherries, smoky turkey, and salty feta make a winning taste combination. You'll enjoy this salad with dried cherries, but you won't want to miss trying it with fresh cherries, too. 1. Combine all vinaigrette ingredients in a jar, cap tightly, and shake well. Refrigerate until needed. 2. Place lettuce in medium serving bowl. Layer evenly with turkey and onions, and then sprinkle evenly with feta and cherries. Serve with vinaigrette to pass. Serves 2 to 3 as main course or 4 to 5 as a side. Refrigerate leftovers. If you live (or visit) in the Dallas, TX, area, be sure to visit a Market Street and get beautiful fresh cherries while they're available. This premiere crop comes directly from the the orchards of Central Valley California, and the folks in the Market Street produce department will even let you sample a taste. 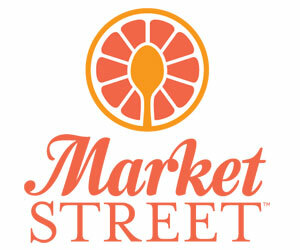 Visit Market Street's profile on Pinterest. Pinning! This salad is in my near future! Gorgeous pictures, and now I'm hungry :) Have a great weekend Joy! Hi there! Visiting from What To Do Weekends. This salad looks so delicious! Cherries and feta? YUM! Your photos are great too! I think I may be the only person out here who doesn't like feta cheese. I don't like blue cheese either! But boy that salad looks delicious! This is MY KIND of salad, Joy! Works very well with a low-carb diet phase 2, as well. Saving it on pinterest to make sometime soon. Oh, this looks such a delicious refreshing salad. Certainly what I need after all my recent indulging! I love this fresh salad for spring and summer. I was researching salads this morning and thinking about making a couple of them this week. Thanks for sharing you delicious salad with us. This looks so delicious! I pinned it. I hope you don't mind. Please e-mail me if you'd like me to remove the pin. Wow, your pictures are stunning! Thanks for sharing this salad. My mom and I are going to love this salad. Thank you sharing. I love cherries, this salad with the feta cheese sounds wonderful! Thanks for sharing at What'd You Do This Weekend?! Oh yum! I love dried cherries in salads and this combination does sound delicious. Thanks for sharing the recipe with SYC. Who could resist such a healthy and delicious dish? My hubby will love this hearty salad. Thank you for sharing your Smoked Turkey, Cherry, and Feta Salad with Vinaigrette recipe with us at the Healthy, Happy, Green and Natural Party Blog Hop. I'm pinning and sharing. This has to be the prettiest salad I've ever seen! I gave a link back and a shout out to you in my post today. Your Smoked Turkey, Cherry & Feta Salad sounds delicious, Joy. The vinaigrette is lovely and flavourful too. Thank you for sharing this lovely and summery salad with us at the Hearth and Soul hop. Pinning and will share. What a great recipe for Smoked Turkey Cherry and Feta Salad, a very tasty combination that we will really enjoy. Hope you are having a great week and thanks so much for sharing with Full Plate Thursday. It is salad season and this one looks amazing!!! Thank you so much for linking up at Tasty Tuesday! Your recipe has been pinned to the Tasty Tuesday Pinterest board! Please join us again this week! Oh, I love the combo! Thanks so much for sharing your delicious recipe at the #sundaysdownunder linky party. That salad looks soooo good! I really appreciate you and your support! I’ve pinned your post too.